SACRAMENTO, California, February 20, 2014 (ENS) – With California suffering its worst water shortage crisis in modern history, state elected officials Wednesday announced new legislation that would provide $687.4 million to help communities deal with the devastating dry conditions and fund increases to local water supplies. 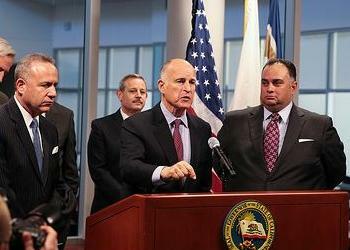 California Governor Jerry Brown joined Senate President pro Tem Darrell Steinberg and Assembly Speaker John Pérez to make the announcement. About $549 million to fund the legislation would come from the accelerated expenditure of voter-approved bonds in the form of infrastructure grants for local and regional projects that are already planned or partly completed to recapture more stormwater, expand the use and distribution of recycled water, enhance the management and recharging of groundwater storage and strengthen water conservation. In addition, $40 million would be transferred out of the state’s Greenhouse Gas Reduction Fund. The rest would come from the General Fund. The measure is certain to be approved by the California State Legislature, which currently has a Democratic supermajority, and signed by Governor Brown, a Democrat. 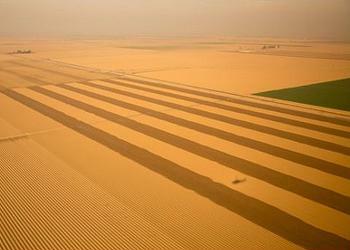 The drought, which could be worse than the historic dry conditions of 1976-77, already threatens California’s $44.7 billion agriculture sector. Safe drinking water is in danger of running out in at least 10 California communities. The legislation would fund emergency drinking water supplies for drought-stricken communities. It would increase funding for state and local conservation corps to assist communities with efficiency upgrades and reduce fire fuels in fire risk areas. After two dry years, storage in key reservoirs is lower than at this time in 1977, one of the driest years on record. And 2014 is shaping up as the driest year in state history, with the water content of the statewide snowpack just 12 percent of normal for this time of year. The proposed measure includes $1 million for the Save Our Water public awareness campaign to inform Californians how they can conserve water. Governor Brown has called on all Californians to voluntarily reduce their water use by 20 percent, and the Save Our Water campaign launched four public service announcements encouraging residents to conserve. The average American uses 80 to 100 gallons of water a day, but due to the drought, some Californians could be allowed just 50 gallons a day. The State Water Resources Control Board said Tuesday it is considering how much water must be provided to meet a person’s basic health and safety needs. Rural areas where residents rely on wells are at greatest risk, as groundwater contaminants become more concentrated with less water to dilute them. In addition to the funding provided by the legislation, the proposed bill calls for the California Department of Public Health to adopt new groundwater replenishment regulations by July 1, 2014, and for the State Water Resources Control Board and the DPH to work on additional measures to allow for the use of recycled water and storm water capture for increasing water supply availability. The bill also makes statutory changes to ensure existing water rights laws are followed, including streamlined authority to enforce water rights laws and increased penalties for illegally diverting water during drought conditions. The bill also provides the California Department of Housing and Community Development with the greatest flexibility to maximize migrant housing units. Several of the legislative proposals were in Governor Brown’s January budget, but would be expedited. 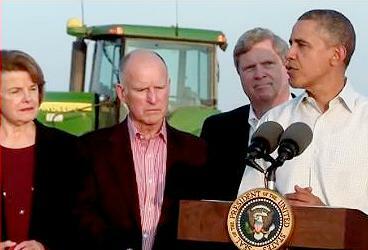 On Friday, President Barack Obama visited drought-stricken areas of California with Governor Brown, Agriculture Secretary Tom Vilsack and U.S. Senator from California Diane Feinstein, to announce federal government assistance. “So we’re going to have to stop looking at these disasters as something to wait for; we’ve got to start looking at these disasters as something to prepare for, to anticipate, to start building new infrastructure, to start having new plans, to recalibrate the baseline that we’re working off of,” the President said. The budget President Obama will send to Congress next month will include $1 billion in new funding for new technologies to help communities prepare for a changing climate, and set up incentives to build smarter, more resilient infrastructure. For immediate drought relief, President Obama is expediting $100 million in livestock disaster assistance for California producers approved under the 2014 Farm Bill he signed earlier this month. The U.S. Department of Agriculture is making this aid a top priority and plans to have the programs available for sign up in 60 days. The federal government will also extend $5 million to California in targeted conservation assistance for the driest areas and another $5 million in targeted Emergency Watershed Protection Program assistance to hardest-hit areas of California to protect vulnerable soils by stabilizing stream banks and replanting upland sites stripped of vegetation. The USDA also will award $3 million in Emergency Water Assistance Grants for rural communities experiencing water shortages and $60 million to California food banks through the Emergency Food Assistance Program. Last week, U.S. senators from California and Oregon introduced the California Emergency Drought Relief Act of 2014, a bill to help California and Oregon farmers, businesses and communities suffering from historic drought conditions. While California is the only state that has declared a statewide drought emergency, other states could benefit from this legislation, the senators said. All 17 Western states covered by the Bureau of Reclamation could qualify for Department of the Interior water grants. In addition, states that have declared local drought emergencies could qualify for USDA emergency funding, including: Arkansas, Arizona, California, Colorado, Hawaii, Idaho, Kansas, Louisiana, Mississippi, Nebraska, Nevada, New Mexico, Oklahoma, Oregon, Texas and Utah.